Governor Malloy actually accomplished the unheard of. He managed to get a state budget passed by the General Assembly well before the final days of the legislative session. There are those who complain that it is not a legal budget because of the 2 billion dollar hole in it. This is the amount that Malloy expects to receive from state employee union concessions. To push the unions along with the negotiations Governor Malloy introduced his ‘Plan B’ budget. Plan B made even deeper cuts to state agencies and reduced aid to local towns. The unions have come to an agreement with the Governor so Plan B should not be implemented. One of the recommendations that Governor Malloy proposed in the Plan B budget was the total elimination of funding for the Connecticut Agricultural Experiment Station (CAES). The Grange has been a strong supporter of the Agricultural Experiment Station. CAES was founded in 1875 and is the oldest Experiment Station in the United States. Its motto of “Putting Science to Work for Society” is as relevant today as when it was founded. 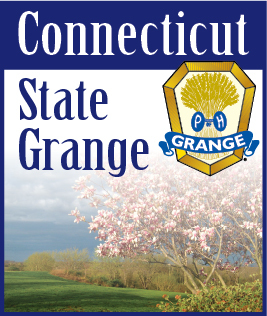 The State Grange sent a letter to Governor Malloy expressing concern that eliminating this facility was even considered. We joined several other agricultural organizations who also expressed concern. The fact that it was even proposed is still a concern. The services offered by this institution are critical to the agricultural community as well as the residents of the state. What is CAES and why is it important? This is where the first hybrid corn was developed. They test vegetable, crop and lawn seeds to ensure that Connecticut residents are not purchasing inferior seeds and that they comply with Connecticut Seed Law. One focus is on the diagnosis of plant health problems. CAES works closely with the USDA Animal and Plant Health Inspection Service-Plant Protection and Quarantine. They are monitoring and regulating several serious plant pathogens with examples being the Ramorum Blight (a.k.a. Sudden Oak Death) and Chrysanthemum White Rust. Other research going on includes the Powdery Mildew of Grapes and the Sudden Dieback of Salt Marshes. Federal law requires that plants be inspected for insects and diseases before they leave the state. All nurserymen must have their products inspected in order to sell them outside Connecticut. CAES is the only facility in the state that does these inspections. No inspection, no shipping. Forestland makes up a major portion of the land mass in Connecticut. CAES monitors the forest land for insects that threaten to invade our hardwood forests. One such notable insect is the Asian Longhorn Beetle which is killing hardwood trees such as horse chestnut, maple, poplar and willow. CAES has been surveying Connecticut lakes for invasive species and what the effects these invasive species have on the aquatic ecosystems. They record arrival and track the spread of invasive species along with testing the effectiveness of herbicides and even mechanical removal. We have heard much of the West Nile Virus lately and CAES is the agency that has been capturing and testing mosquitos for West Nile. They have a strong history of monitoring the mosquito population. They were very active in following the spread of the Yellow Fever and Malaria in the early 1900’s. Throughout its history CAES has been very involved in the spraying and control of the mosquito population around the state. In 1996 they identified and began tracking the mosquitos that were spreading the Eastern Equine Encephalitis in southeastern Connecticut. They are also capturing and testing ticks for Lyme disease and are now tracking and testing the recent invasion of bed bugs. There are two other CAES stations besides the one in New Haven. The Valley Laboratory in Windsor developed shade tobacco in 1901 which was a major crop in the valley. The Lockwood Farm in Hamden is also a part of CAES. This is just a portion of what the Connecticut Experiment State does for our state. The continued scientific advancements and research that is conducted by CAES is critical for the safety of Connecticut residents and agricultural community.